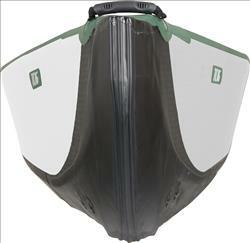 The World's First High Pressure All Drop Stitch Rigid Inflatable Canoe has arrived! 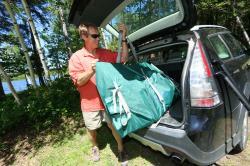 Say goodbye to heavy, unstable, tippy, nearly impossible to store and transport canoes! The Patent Pending Sea Eagle Inflatable Travel Canoe™ packs down small enough for a small car truck or closet with room to spare and sets up in under 10 minutes! Introducing the World's First and Only All Drop Stitch Constructed Inflatable Portable Packable Canoe! Fully inflated the Sea Eagle 16ft Travel Canoe is sixteen feet long, thirty eight inches wide (at center), and twenty inches deep at the highest points with a max load capacity of 915 lbs! This incredible canoe packs down to a mere 39" x 24" x 12" rectangle, fits into it's own bag and weighs only 60 lbs. 33% lighter than traditional hard shell canoes of the same class and category the TC16 still fits into the small trunk of a Mini Cooper! With 3" thick rigid high pressure (10 psi) inflatable drop stitch gunwales (side rails) that stand 20" at the highest points and are set at a 15° angle with a 16' long x 25" wide x 3" thick rigid high pressure (10 psi) inflatable drop stitch floor you not only have incredible initial primary stability but you also have outstanding secondary stability. Far more stable than traditional rigid hull canoes! The flat three inch thick high pressure (up to 10 psi) side and floor chambers create a narrow, rigid and extremely spacious canoe. This construction system allows us to literally reinvent the traditional canoe in a unique inflatable form and provides previously impossible benefits. Greater safety, incredible stability and incomparable portability with no sacrifice to paddling performance. To make the Travel Canoe 16 as tough as nails, we have added additional protective layers to every side of this canoe. This means there is an extra outside layer of 1000 denier fabric over the existing 1000 denier drop stitch material on all sides. This results in the toughest and most durable inflatable we have ever made. Unlike traditional rigid canoes, our Travel Canoe has added buoyancy from the inflatable air chambers of the floor and sides. This means while adhering to the Travel Canoes specifications it will not sink. In addition, because the air chambers have inherent buoyancy you can load this canoe with hundreds of pounds of supplies and still paddle and maneuver easily. Best of all this inherent buoyancy makes the Travel Canoe safer in whitewater rapids (up through class IV). The Travel Canoe is more stable than many traditional canoes because of the Double Chines that run the entire length of the canoe. All canoes have some form of primary and secondary stability. The Travel Canoe actually has three forms of stability. The two distinct chines along with the flat bottom contribute to stability, speed and tracking of the Travel Canoe. The first chine is formed where the drop stitch inflatable floor meets the drop stitch inflatable side walls. The second chine comes from the angle of the drop stitch inflatable side walls. This results in primary stability from the flat bottom, secondary stability from the first chine and additional stability from the second chine. The Travel Canoe features bow and stern molds that cut through the wind, water, waves and current while creating lift reducing drag and friction. 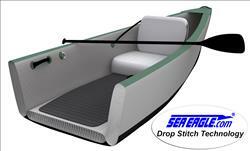 The added feature of the large removable rear skeg further improves speed and tracking because the skeg reduces the natural yaw of a canoe and makes forward motion far more efficient. 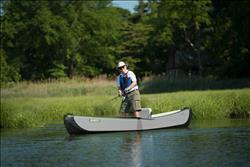 The skeg is designed for use on open water and windy conditions. It can be removed in seconds for use on whitewater or when using the J-stokes. 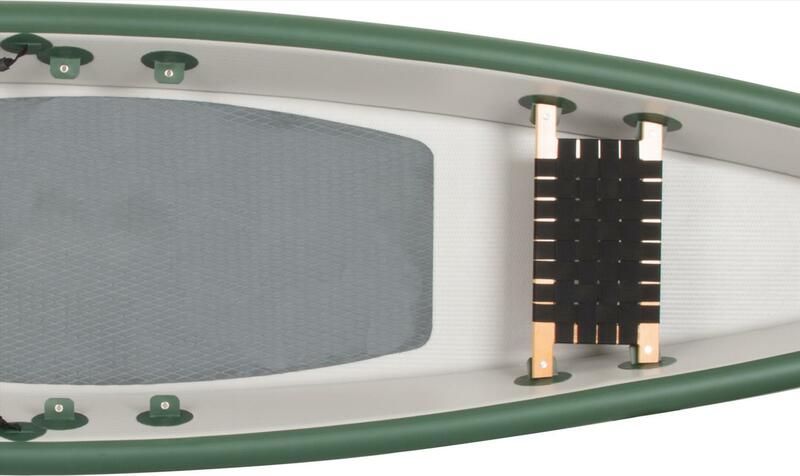 To provide safe and secure footing when getting in and out of the Travel Canoe we have added a layer of diamond pattern anti-skid EVA foam decking. This not only makes this canoe safer to stand on (especially when fishing and casting) it adds an additional layer of protection to the floor. To secure the drop stitch inflatable seats to the floor while providing maximum adjustability (for one or two paddlers) we have added hook and loop strips to both the floor and underside of each seat. Not only is the Travel Canoe 33% lighter than rigid canoes of the same class but it also deflates and packs down to a mere 1/4 of its inflated size. This means the Travel Canoe will fit easily into the smallest car trunks for both easy storage and transport, making it readily available for use at all times.